← Do writing retreats work??? 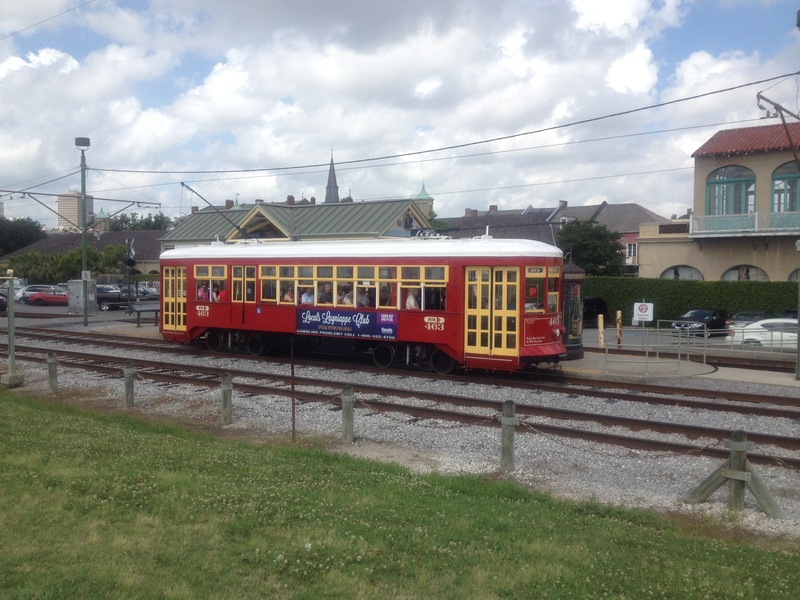 I returned from New Orleans over a week ago – but, sadly, I brought a hideous flu-like bug home with me, so it’s taken me a while to get around to writing this blog. The post is going to be largely a gallery of pictures, as I took so many, and have spent half this afternoon downloading them and sorting them out. But if a horrible bug is the price I have to pay for visiting New Orleans, I’ll accept it. 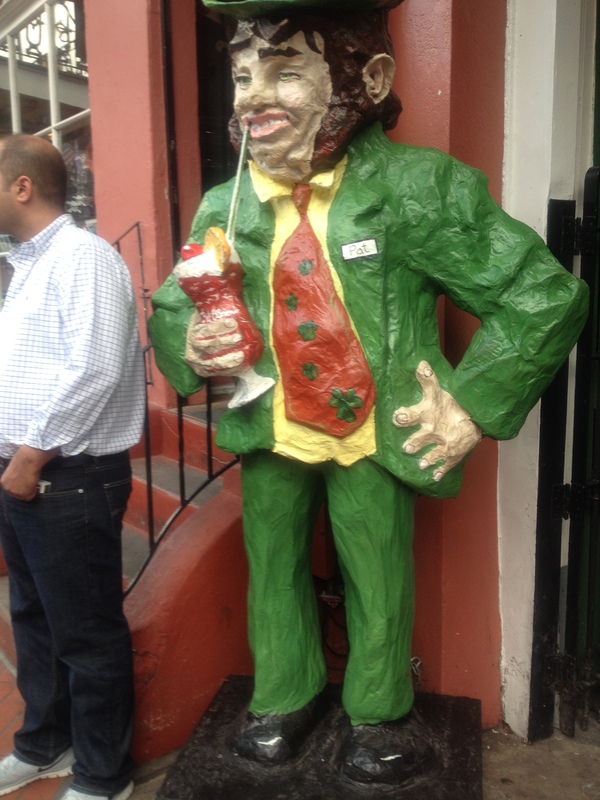 New Orleans is fantastic. From the massive Mississippi River that, from our hotel window, we could see rolling by, to the street cars, to the deep-fried cuisine, to the funny smells on Bourbon Street, I loved it all. The street musicians, the sunshine, the fabulous balconies, the bars and restaurants, the fantastic feeling of warmth and friendship, I loved it all. 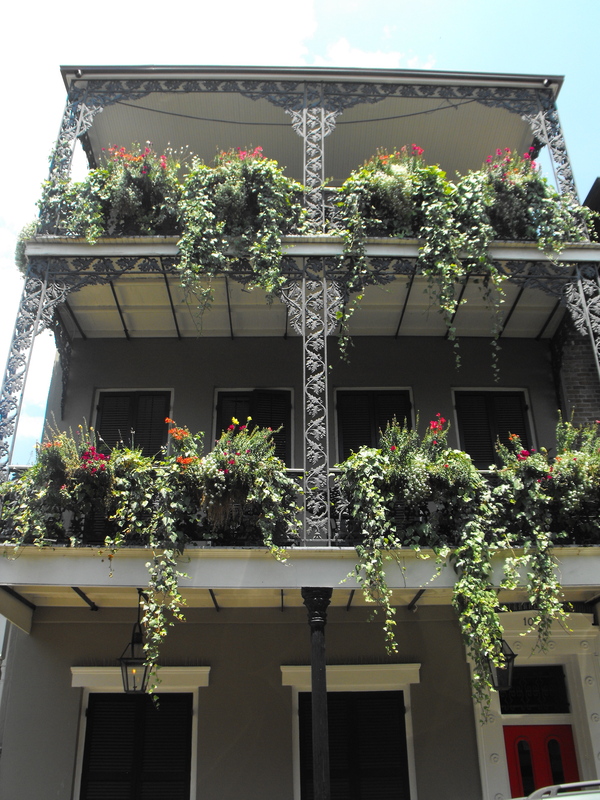 The balconies of the French Quarter are gorgeous – I never got to the Garden District to compare them but it’s hard to think of their being an improvement. The traditional details are stunning. 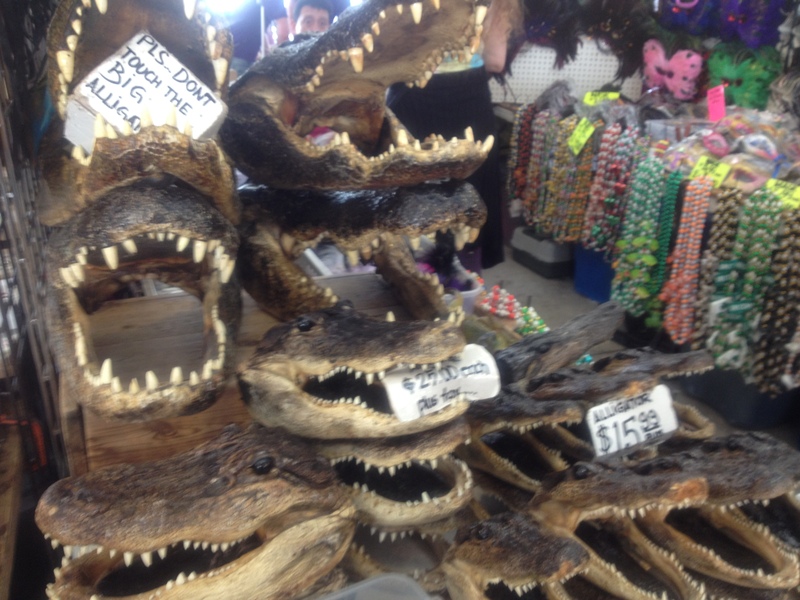 Alligators for sale. Real or contrived? 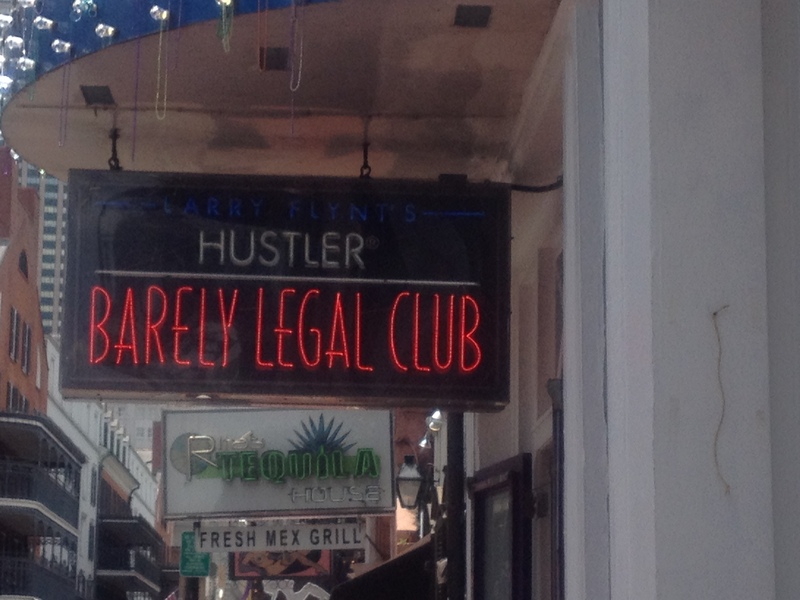 Bourbon Street by any other name. Both magical and sleazy but always fun. Probably the only city I know where a big machine comes out and disinfects the roadway in the morning. The street cars looked great but I didn’t get the opportunity to ride one. 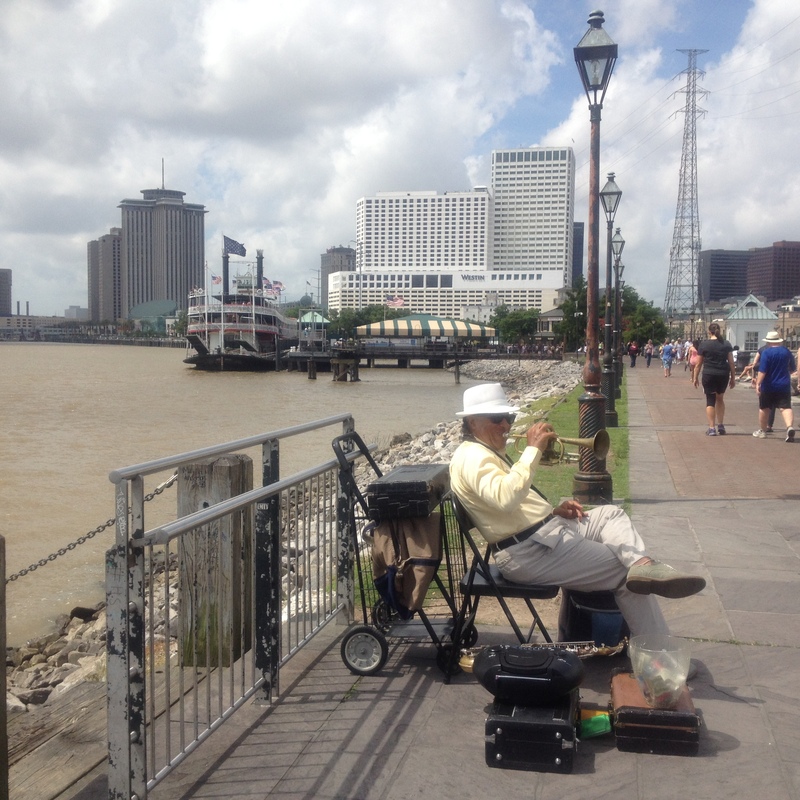 A musician playing trumpet on the banks of the river – as you do. 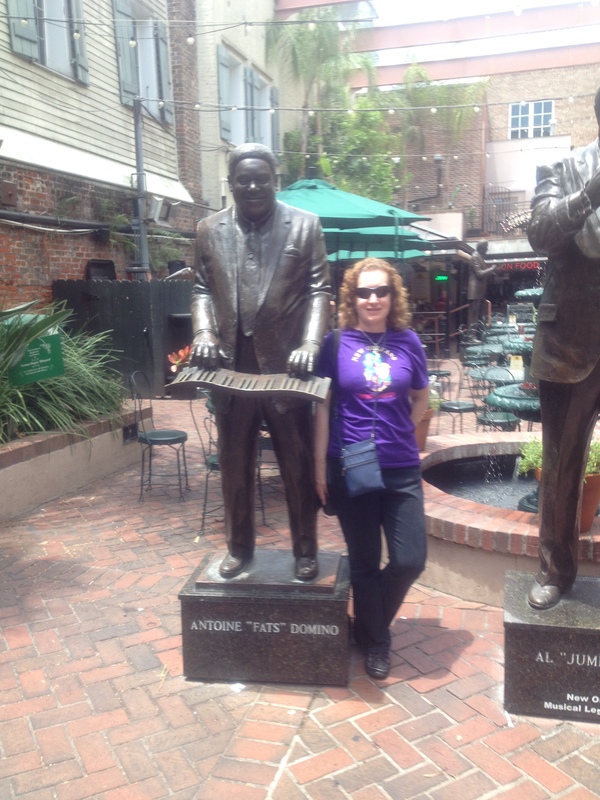 As you do in New Orleans, anyway. Somewhere to tie your horse while you drink in the bars. 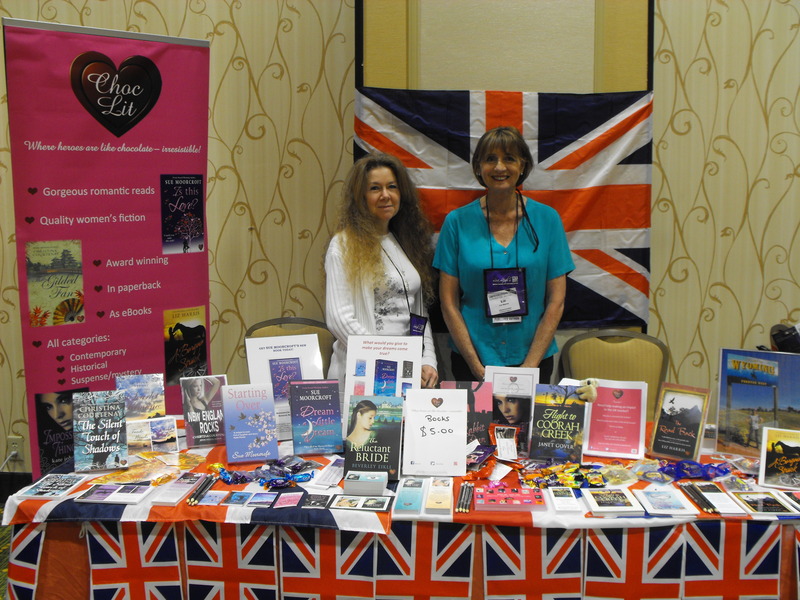 Christina Courtenay (Pia Fenton) and Liz Harris on the Choc Lit stand. I never found out why. But I do qualify. Dancin’ in the street. If you hear a jazz band marching along just go and join right in. 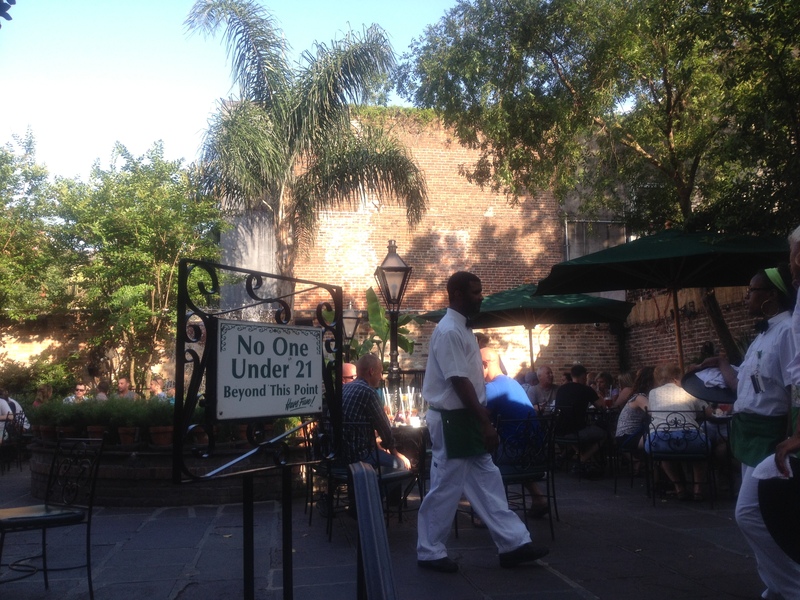 At Pat O’Brien’s on Bourbon Street. If you’ve ever wondered what gumbo is, this is it. Somewhere between a stew and soup with rice. 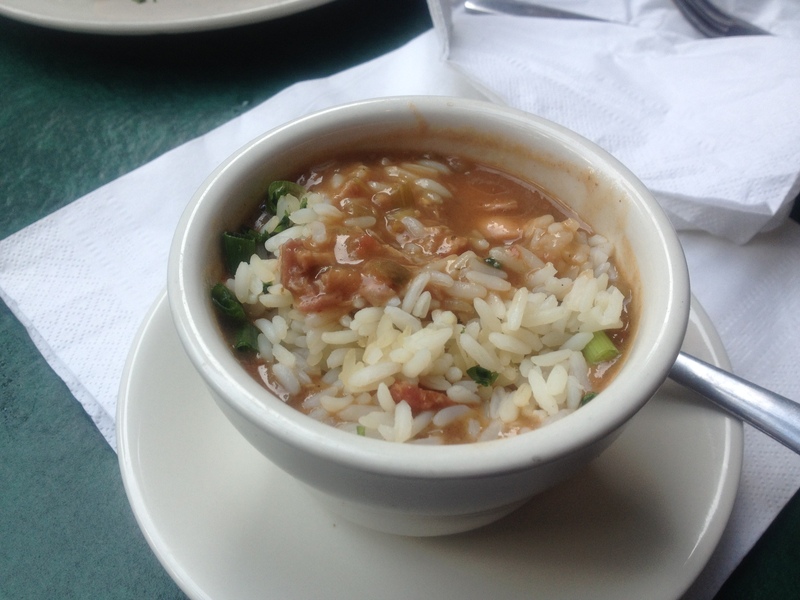 Some gumbo is much better than others. This pic shows the good sort. Nicolas Cage’s tomb. No, I know he’s not dead. He obviously believes in planning ahead. 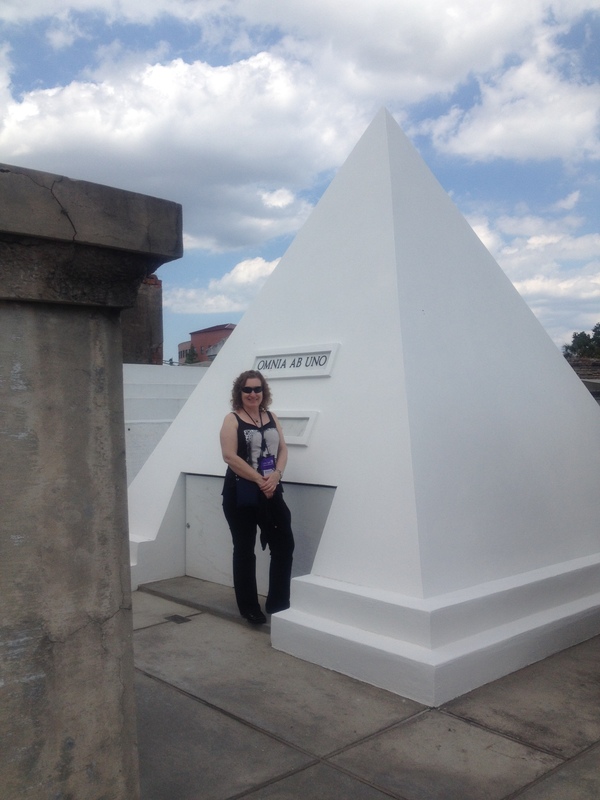 This may (or may not) be the tomb of the voodoo queen. I left her a penny and knocked three times, so she knew that I’d been. The violinist was so good I nearly cried. 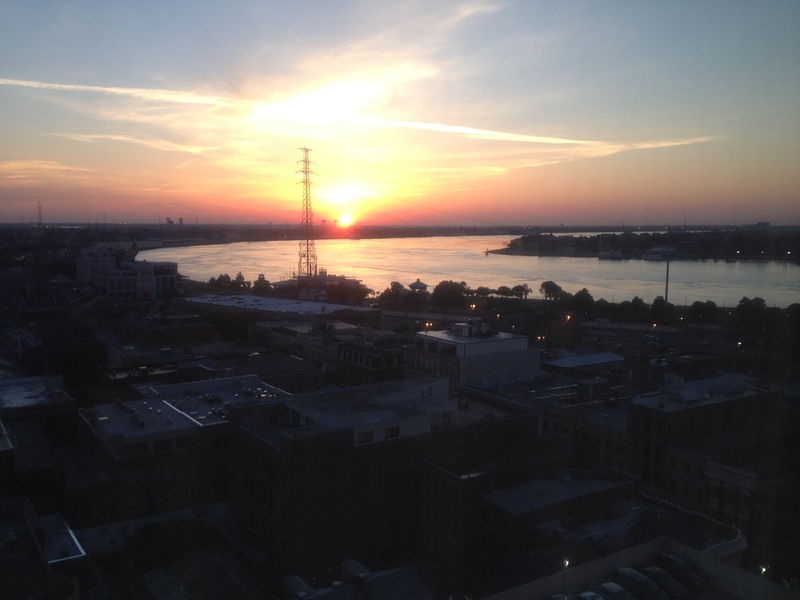 Dawn breaking over the Mississippi. Incredible Sue. Thanks for sharing your photos. Hope you;re over the bug now, but as you say – worth it. 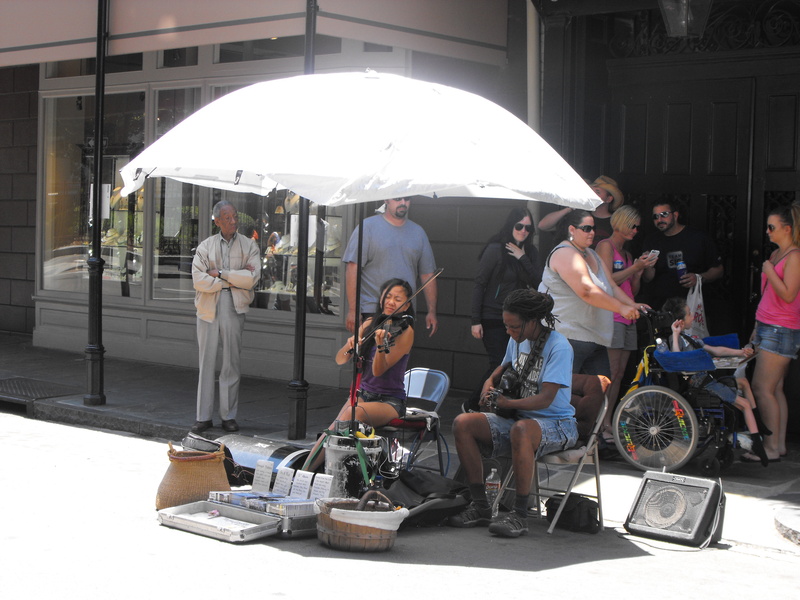 Oh wow – I’m totally smitten with New Orleans just from your photos. Thanks for sharing Sue! Absolutely brilliant pics, Sue, thanks for sharing. I lived in the States for a while in the 1960s but sadly never got to New Orleans. Hope you’re feeling better now. I came home with something too! I’m still not over it 100%. I hope you’re feeling better. love your photographs and it was so lovely to meet you! 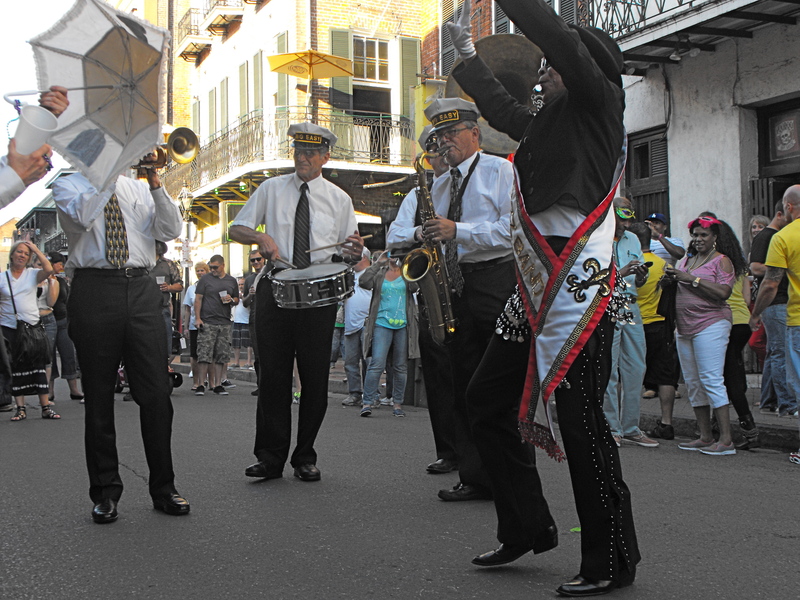 Suddenly I feel the urge to be in New Orleans. Great pictures! Thanks, Frederick. I hope that you enjoy NOLA as much as I, when you get there. 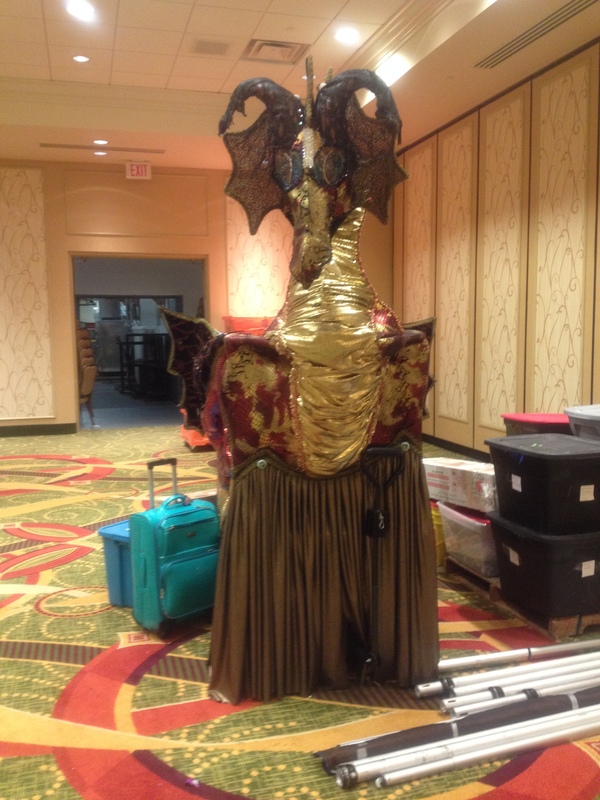 Sue; I love New Orleans and it looks like you had a great time on your trip and got to see the best parts. Lovely to see the photos Sue. 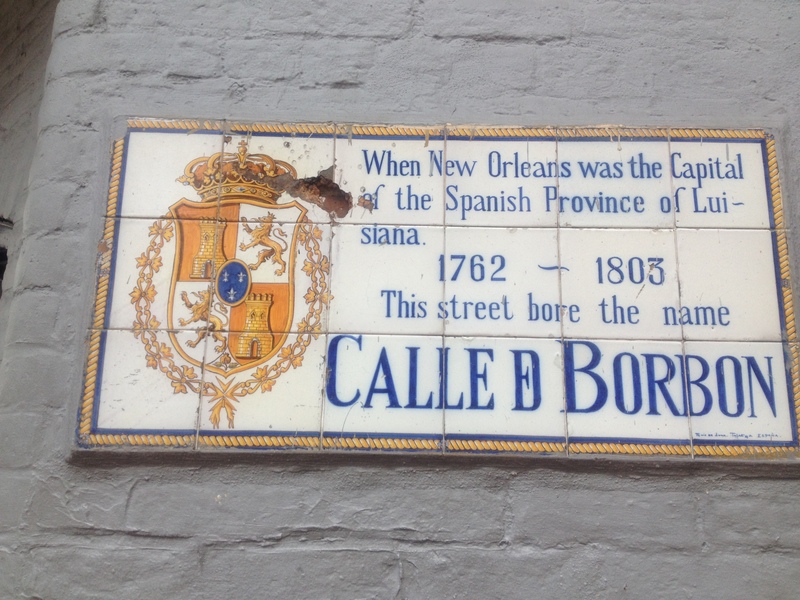 New Orleans always sounds so full of colour and history. So pleased you’re beginning to feel more like yourself again. Wow – what a wonderful collection of photos – a real flavour of the city. I’ve never been, but now I’d love to go! It all looks so fabulous – it must have been great if it was worth a case of the lurgy! Glad you’re on the mend, Sue. It all looks fantastic – thanks for sharing the photos, Sue. Would love to attend such a gathering one year! I’ve just read a book set in New Orleans, your pictures really gave me a flavour. It’s on my list of places to visit. While I was there, Jules, I remembered Linda Howard’s ‘Kill and Tell’ and I purchased it on Kindle so that I could read it. I was able to place pretty much everything in the book (apart from Det Mac Chastain, sadly) and the heroine stayed into the same hotel in which I was staying. Very cool. Wonderful, story telling photos, Sue – the next best thing to an actual visit! Thank you so much for sharing the photos! 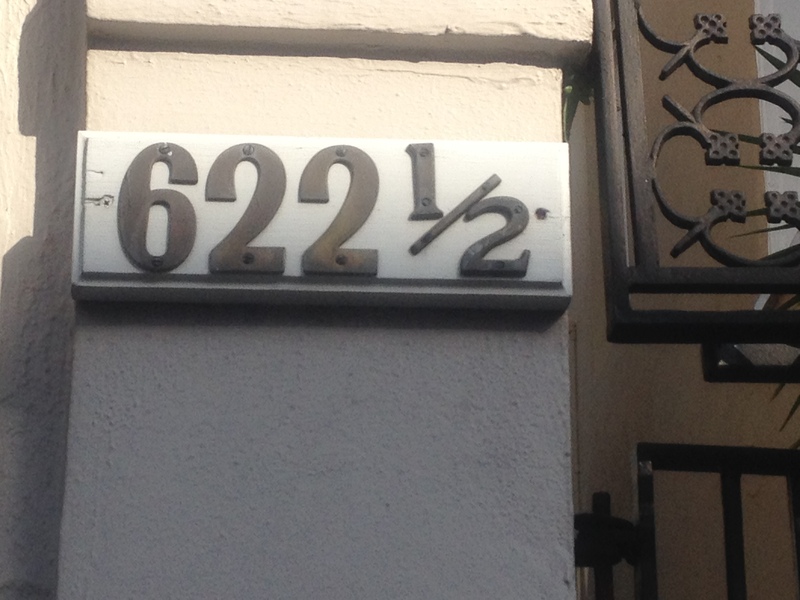 Always wanted to go and never got there. But this gave me a *taste* LOL.